Reveal the mysteries surrounding harmony guitar parts, and the interesting harmonized sounds that are waiting for you to explore. 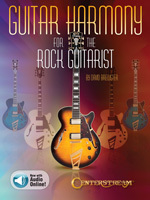 In this book you�ll learn the construction and application of intervals, general rules of harmony, and various harmonization techniques, featuring countless examples and harmonized approaches. 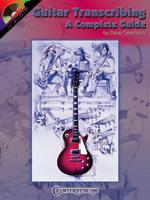 The online audio that accompanies this book features every example (77), and will help you hear the various and different approaches for harmonizing multiple guitar parts. Learn that solo now! Don't wait for the music to come out � use this complete guide to writing down what you hear. Includes tips, advice, examples and exercises from easy to difficult. Your ear is the top priority, and you'll train it to listen more effectively to recognize intervals, chords, note values, counting rhythms and much more for an accurate transcription. There�s nothing more distracting than hearing a musician play out of tune. 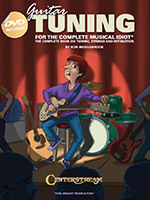 This user-friendly book/DVD pack teaches various methods for tuning guitars � even 12 strings! -and basses, including a section on using electronic tuning devices. Also covers intonation, picks, changing strings, and much more! From the irresistible party jams of South Bronx to the urban sounds of today, hip-hop has maintained close links with its roots. Many of its characteristic sounds and beats come from funk, soul, and R&B origins. 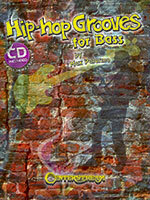 The electric bass plays a key role in creating the groovin� that gives hip-hop a unique, attractive feel. This book/CD set contains 90 authentic hip-hop licks that will lead you to the vibrant world of hip-hop style. All the bass lines are demonstrated on the CD�s full-performance tracks and transcribed in standard notation and tablature. Jamming along with these patterns, you will improve your technique while you learn how to lay down the right groove. Just listen to the tracks and concentrate on playing with a good-time feel. Enjoy! 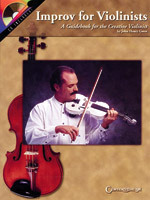 In this book, author John Henry Gates aims to help violinists increase their versatility and improvisation skills. Song forms, harmonic structure, and the Nashville number system are explained in a practical, applicable manner. Ways to gain experience and the best ways to amplify your instrument are also covered. The CD includes demonstrations of various styles in several keys along with minus one versions of the same tracks for practicing. Each track is unique, yet simple and straightforward, the obective being to give the player experience with a real rhythm section to gain the confidence to improvise.